Okay- So a customer calls with a problem. She received her order which consisted of two boxes. One of the boxes, contained her Biography albums, the other should have contained the rest of her order............. paper and things. Instead she opened the box and there was a small lunch cooler inside with a lock on it. One of the employee’s at the store, could swear that the cooler was ticking. Tick…..Tick……Tick…..Tick. So………..They called the Police. The Police didn't hear any ticking and unlocked the cooler. They opened it up to find a vial of Horse Urine. The sample came from Thermo-Campbell Scientific, our neighbors, who specialize in shipping animal urine all over the country. Apparently the UPS people mixed up our packages. We're just happy it happened to us instead of our other neighbor, Swire Coca Cola Bottling Company. For those of you that don't know, next time you get a Cosmo Cricket Paper Crafting Kit, before you throw away the front cover (or cut it up for scraps) check out the back side. 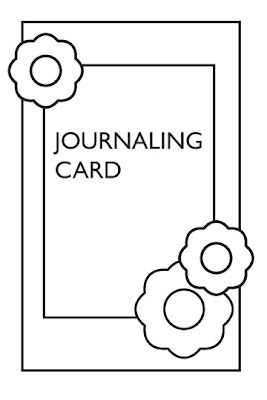 It is filled with little sketches for layouts and cards. I used the below sketch to make this super-quick card. Can you say easy-peasy-lemon-squeezy? Allison Schubert! We found Allison on twopeas with the "Beautiful Soul" Wanted Layout shown below. We just loved it! Isn't she amazing? Congratulations Allison, you are now and forever a Cosmo Picasso! A clean house, which never happens. Routine, if my daily routine is messed up my whole day is completely off coffee, has to be Folger’s. I am a very open scrapbooker, I can scrap about anything and everything I am also not set in one particular style so my style can change from day to day. My high school days were split between regular high school and an art school where I took photography and other art classes. But, it wasn’t until the birth of my daughter that I took those classes and intertwined them with the documentation aspect. Go to the internet or listen to songs. I can usually here a line in a song that can give me a spark. Other than scrapbooking I have to go to the gym at least six times a week. But, I have also been known to go twice a day as well.. I don’t…I turn the tv on just for the noise. I pay too much attention to lyrics in music to be able to get anything accomplished. What’s your most embarrassing memory & did you scrap it? 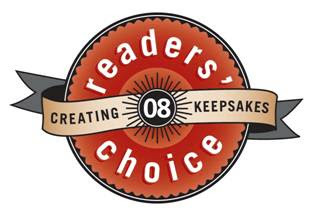 The voting is now open for the Creating Keepsake's Reader's Choice Awards. All you have to do is to click this link, give them your name and address and vote away. We won't bribe you, but we would love it if you placed votes for us! We have considered making up lots of names and addresses so that we can vote multiple times, but have decided against it. Not because it is beneath us...... oh no....... but because we are way to busy to do something like that. In other words, if you wanted to........ just joking! One great thing about my job is that I get to meet a lot of people. On a trip to Canada I met Samantha from Karen Fosters. She is one of the funnest people you could ever meet because she has this little obsession with questions. That's right, questions. Sam has 14 pages of written questions that she keeps with her most of the time (they have the honey mustard stains to prove it). These aren't questions like where we came from or why we're here or any of those other deep things. These are fun questions to ask people so that you have more to talk about than the weather. I asked her to send me some of her favorites to post on our blog and she was kind enough to oblige. We'd love to see your answers, so be sure to post. What two bands/singers (one still playing together/alive and one not together/dead) would you like to come play at your b-day party (e.g. Aerosmith/Abba)? If you could have dinner with one living famous man and one living famous woman who would they be (you all three have dinner together)? If you could have dinner with one dead famous man and one dead famous women who would they be (they would not show up like something out of a horror movie...they would look normal!). If you had the perfect mate and the rest of the world was either all male or all female, which would you choose (this is tougher than it seems...). If you could have one superhero talent, what would it be (e.g. being invisible)? If you could be one famous person for a day who would you be and what would you do? If you could be one of our friends or family members for a day, who would you be and what would you do? You know you’re an artist if you want fame, glory and free product all at the same time. On that note, we would like to introduce the Cosmo Cricket featured artist program that we are calling Cosmo Picasso. What does it mean to become a Cosmo Picasso? Just having your photo and work displayed on our site with a little write up about what makes you tick and why you’re so wonderful. Oh yeah, and getting free Cosmo Cricket products. Now, you may be wondering, how do I become a Cosmo Picasso. Well, don’t worry, you won’t have to cut your ear off or anything (that’s why it’s not Cosmo Van Gogh). Simply make amazing Cosmo projects and post or publish them where we can find them. This means using Cosmo Cricket in the title when you publish on boards like twopeas, scrapbooks.com, lifetimemoments, etc. We are keeping our eyes out, so get busy! A new artist will be featured each month. PS: The above message was inspired by all the many talented designers that send us photos of their work. We would love to have a spot for each and everyone of you on our team, but since we can't, we hope the Cosmo Picasso program will give us a way to feature you and your work.